The record is made up of 13 b&w photographic prints within blue card mounts, bound into one volume. It was created in c 1907. It was written in Urdu and English. The original is part of the British Library: India Office The department of the British Government to which the Government of India reported between 1858 and 1947. The successor to the Court of Directors. Records and Private Papers. The album contains historical and architectural views of Mecca and Medina in Saudi Arabia, which relate to a South Asian Muslim perspective of the hadj. Mechanically printed indigo double bars form a decorative frame on each window mount and are set approximately 10mm from edges. These intersect to form cruciform detailing and further decorative features. The same mechanical process and ink have been used to inscribe the initials ‘K.P.L.’ along the leftmost lower edge of the double bar detailing. In addition, in the same ink, a mechanically printed crescent moon and five-pointed star appear above the caption of each image, in the centre of the uppermost edge of each window mount. Urdu inscriptions (nastaliq script) – in the form of prose and poetry, a caption and the name of the photographic firm – in hand applied red ink are set around each image. A stamp, applied directly onto each print and in the lower left-hand corner of each mount in Arabic script reads ‘copyright registered ’. "H. A. Mirza & Sons, Photographers. [....[caption]....with a brief description.] One sheet. Published by the Photographers: Delhi [Octr. 15, 1907.] 14x18° Litho. Ist Edition. Price, R.1, A4"
Whereas the images in this album appear in a sequence devised, presumably, by the India Office The department of the British Government to which the Government of India reported between 1858 and 1947. The successor to the Court of Directors. Library, evidence put forward by Asani and Gavin in their essay 'Through the Lens of Mirza of Delhi' ( Muqarnas , Vol. 15 (1998), pp. 178–199) would indicate that the sequence of the only other extant and near identical copy of the album, collected by Fouad C. Debbas of Beirut, follows a more logical sequence: five scenes in or near Mecca, followed by seven scenes in or near Medina. The second photograph in this album, which depicts the Haram at Medina (Photo 174/2), does not appear in the Debbas album, however, the prose and poetry surrounding the image are identical to those featured in Photo 174/4, which depicts he Haram from an alternative angle. 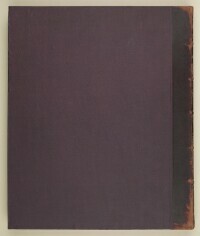 Maroon quarter-leather album containing thirteen prints held within window mounts. 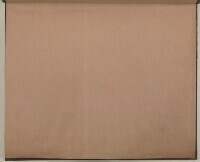 While binding is still sturdy, extensive scuffing to the spine is evident. All window mounts are extensively bowed and edges are scuffed. The window mounts are stained in places, faded in others and warped throughout. The prints themselves show signs of fading, extensive bubbling and distortion across the surface. Some also show signs of surface losses. 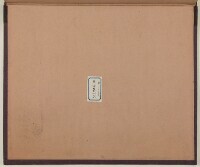 The album has been foliated, 138–150 and 1–13; the numbers are indicated on the recto The front of a sheet of paper or leaf, often abbreviated to 'r'. , in pencil, along the right hand edge and on the verso The back of a paper sheet or leaf. adjacent to the letterpress label, predominantly in ink. The album is bound in maroon quarter-leather format, which is heavily scuffed along the spine. 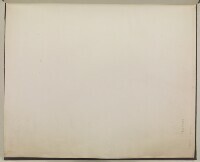 This binding dates to the accession of the images (1909) into the ‘Secretary of State for India Library’ and is indicated as such on the upper part of the spine by a gilt stamp. 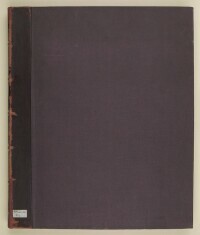 The spine also features gilt title: ‘Views of Mecca and Medina’. The binding features a linen and card joint.